The amount of snow that fell during the Climate Conference ranged between 10 cm and 50 cm in a day. 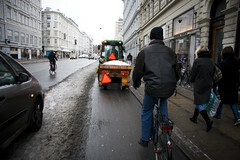 Most of the bike lanes along the main streets were cleared pre-emptively of snow but less busy streets had to wait a day or so for snowploughing. 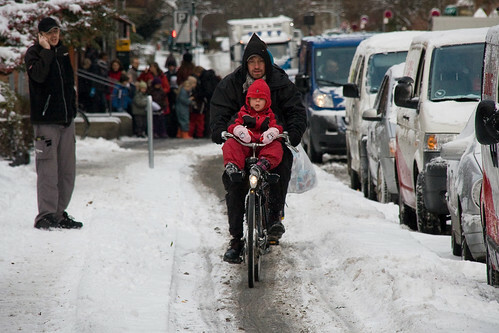 The reason was not just the amount of snow, but also the fact that Copenhagen's resources were apparently stretched to the limit during the climate conference so the usual level of service was delayed. Nevertheless, Copenhageners just slowed down and took it easy until freer passage was available on bike lanes like the one above. It's snowing again as I write this and we're back to normal. The bike lanes are cleared and salted while snow lies on either side. 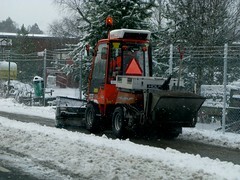 The City is responsible for clearing the bike lanes of snow and debris. House/building owners, like most places, are responsible for the sidewalks. 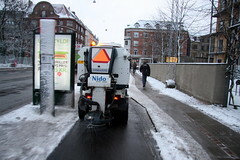 Brushes are used on the bike lane maintenence vehicles. At the back, salt is spun out onto the bike lane. 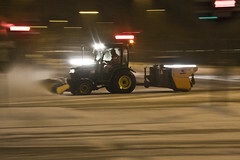 The brushes are generally adequate even in heavy snowfall since the snowploughs will run up and down busy sections in repetitive cycles if need be. As opposed to waiting for the snow to fall and THEN clearing it. More bicycle infrastructure maintenence vehicles. 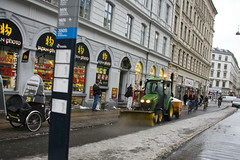 The photo on the left is of a tractor that was drafted in during a snowstorm to assist the regular bike lane vehicles. 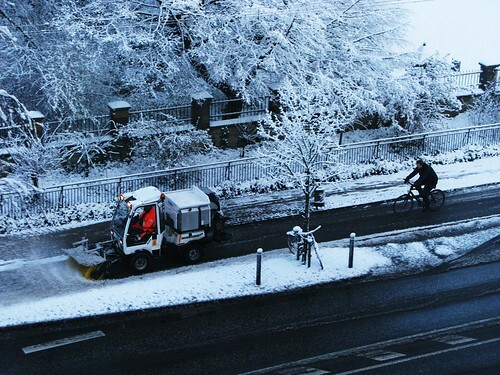 Even in smaller towns in Denmark and, in the photo above, Sweden, bike lanes are cleared regularly. Our summer house is near Höör, Sweden, a town of about 7000 people, and here they clear the bike lanes with ploughs to allow the people free passage on two wheels.